In the early 20th century, the newly emergent folk dancing movement fell to departments of education, particularly departments of physical education. The "education market" fueled the development of folk dancing until the late 1950s, when the growing recreational international folk dancing movement became large enough to support a flood of foreign dance teachers and small-scale phonograph record manufacturers. In the 1960s, widespread proliferation of pirated cassette tape recordings forced the phonograph record manufacturers back to the education market, but the disastrous economic policies and budget cuts of 1973 limited the folk dance phonograph record business to those with educational credentials, in other words, those who were members or allied with the American Association for Health, Physical Education, Recreation and Dance (AAHPERD). Unfortunately, this shift in the supply of music allowed the physical education "muscle mechanics" to dominate the folk dance publishing industry, resulting in a lack of attention to non-physical aspects of folk dance, such as styling, context, geography, ethnography, history, orthography, pronunciation, and everything else that contributes to the unique atmosphere or mood of folk dance. Physical education teachers across the country, including many of our notable folk dance leaders and teachers, joined the AAHPERD for professional reasons. Most of them of whom I am aware, however, maintained those non-physical aspects of folk dance, such as the styling, ethnographic background, and recreational aspects of folk dance. Of those who did not, well, the less said the better. 1885  The Association for the Advancement of Physical Education (AAPE) is founded. 1886  Name changed to: The American Association for the Advancement of Physical Education (AAAPE). 1903  Name changed to: American Physical Education Association (APEA). Midwest members, feeling discriminated against by Eastern members, formed the Midwest and Central Districts of AAAPE. Notable in this development was Delphine Hanna at Oberlin (Oberlin, Ohio) who became the first woman professor of physical education. She pioneered physical education programs for college women, a movement that still continues against the headwind of male athletics. Ms. Hanna instructed Luther Gulick, who mentored Elizabeth Burchenal, one of our most famous early folk dance leaders, teachers, and authors. 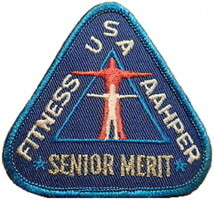 1933  Name changed to: American Association for Health and Physical Education (AAHPE). 1938  Name changed to: American Association for Health, Physical Education and Recreation (AAHPER). 1974  Name changed to: American Association of Health, Physical Education, Recreation and Dance (AAHPERD). 1970s  Name changed to: American Alliance for Health, Physical Education, Recreation and Dance (AAHPERD). 2013  Name changed to: Society of Health and Physical Educators (SHAPE America). For a more detailed historical account, see the Website of Shape America: www.shapeamerica.org/about/districts/midwest/History.aspx. For a broader view of MDAAHPERD history, see The History of the Middle West Society of Physical Education from 1912-1933 by Mabel Lee, Lincoln, NE, 1963. Lee also published fascinating books about her early days as a "bloomer" girl (women were required to wear bloomers in those days). Journal of the American Association for Health, Physical Education and Recreation, a magazine. Washington, D.C.: American Association of Health, Physical Education and Recreation. Materials for Teaching Dance, Vol.II, for Folk, Square and Social Dance. American Association for Health, Physical Education and Recreation. Washington, D.C.: American Association for Health, Physical Education and Recreation, n.d.